​Yoga tightens and tones the entire body, enhances balance, improves flexibility and builds core strength by combining traditional fitness training, focused breathing and strength building through yoga poses. The result is a mind-body workout that improves health, athletic performance and mental acuity in people of all ages and fitness levels. 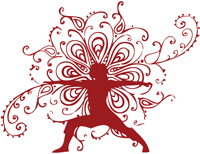 Red Door Yoga® is a registered trademark of Hickey Karate Center, Inc.